On March 11, groundbreaking global news channel begins their broadcast. NEP Studios has developed a fully integrated production space for the New York news center of Arise Networks, a newly launched global television network that will deliver news, current events, and entertainment programming to audiences across the United States, Europe, and Africa. 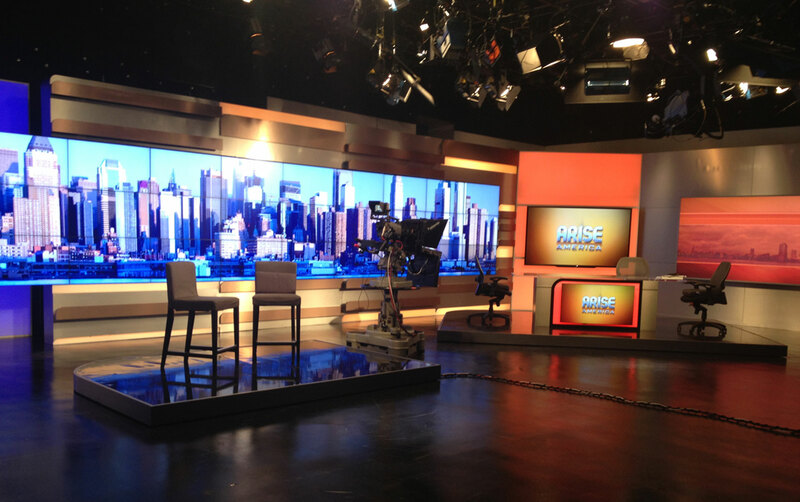 Arise Networks launched two programs, Arise Entertainment 360 and the talk show Arise America, from NEP’s New York facility on March 11. Within its 401 Fifth Avenue facility, NEP Studios divided a 6,000-square-foot studio into two 3,000-square-foot studios, one for the Arise Network and a second for an adjoining client already using the larger studio. NEP Studios designed and built two HD control rooms for the two clients with multiple fiber patches connecting the control room and studio on the eighth floor with the newsroom and offices on the seventh floor. The fiber connectivity gives the network a high level of flexibility for broadcasting from the studio or from standup positions in the newsroom. NEP also enabled the network to bring live feeds in from its London broadcasting center. “With a constant stream of live and breaking news, networks like Arise often need to change how and where they report information to their viewers, and require a great deal of flexibility from their studio facility. With these needs in mind, we tackled the challenge of creating a completely new studio from scratch in a very short time without disrupting the program in the studio next door,” said Barry Katz, senior vice president and general manager of NEP Studios. “The result is a great solution that easily accommodates the large staff and unique technical challenges that come with a major international news operation. Founded by African media leader Nduka Obaigbena, Arise aims to become a global media network reflecting the experiences of underserved communities, championing the voices of the African diaspora across all continents, and engaging citizens of the world. In addition to New York and London, Arise News will operate news centers in Johannesburg and Lagos, Nigeria, with additional news bureaus in Washington, D.C., Brazil, Beijing, New Delhi, and Los Angeles. For over 30 years, NEP has been a worldwide outsourced technical production partner supporting premier content producers oflive sports, entertainment, music and corporate events. Our servicesinclude remote production, studio production, audio visual solutions, host broadcastsupport, premium playout, post production and innovative software-based mediamanagement solutions. NEP’s 3,500+ employees are driven by a passion forsuperior service and a focus on technical innovation. Together, we havesupported productions in 87 countries on all seven continents. NEP is headquartered in the United States and has offices in 24 countries. NEP The Netherlands (NEP) announced today that it has acquired Facility House Broadcast Group (Facility House), effective 4 February. Based in Hilversum’s Media Park centre, Facility House is a full-service broadcast services company and the third largest provider in the Dutch TV broadcast market. After a short transition period, Facility House will be rebranded as NEP and become part of the NEP The Netherlands division. NEP's Australia team wins IABM's Broadcast/Media Company of the Year for their innovative Andrews Hubs. NEP Group, the leading worldwide outsourced technical production partner supporting premier content producers of live sports and entertainment, announced today its acquisition of Baltimore-based Broadcast Sports International, LLC (“BSI”).